My darling wife Hadley & I recently returned from our first reel vacation that was not attached to any kayaking function. We spent three wonderful weeks touring Italy. I have to say we have many golden memories and 978 pictures. We loved walking through ruins, which painted a pretty good picture of daily living in places such as Rome, Pompeii, Herculean, Florence, Pisa and Venice. We also enjoyed the quiet pace of Sorrento and Cinque Terra. Most of all we cherished the friends we made along the way. Some were locals and some were fellow travelers. Every once in a while you run into a kindred spirit. I found mine in Sorrento. 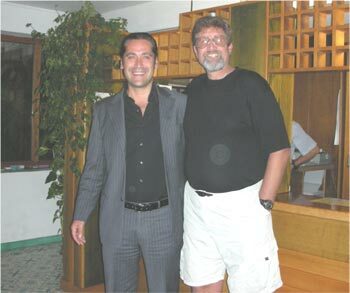 Stefano and his family run a great hotel on the cliffs of Sorrento directly over a small harbor (Hotel Settimo Cielo). When Stefano found out I was a kayaker he shared with me his passion for skin diving and spear fishing. During one of our many long talks we found the common thread of both of our passions was being in the outdoor elements and “feeling alive.” I am so glad Stefano spoke English because if we had to depend upon my Italian we would still be doing hand signs just to get my room key. We both laughed when we discussed how others (family and friends) look at us when we go out in rough conditions or nasty weather. Even if he doesn’t catch any fish Stefano loves just being out in the ocean and feeling the water seeping into his wetsuit. I told him of my many rainy day paddles and surfing storm waves. We both agreed that being in the outdoors made us both feel alive. The sensations brought on by the elements flood the senses. Getting outdoors also allows us to take time to reflect on what is important to us. The reduction of man mad noises allows one to think more clearly. As I said we had a great time in Italy touring around. However, one of my more special moments was when Hadley & I rented a double kayak in Sorrento and spent a few hours paddling along the cliffs looking at ancient ruins. In addition we stumbled into a small grotto and waded around in the refreshing water. That short paddle made the time in Sorrento more special for the two of us. When I asked Stefano where I could rent skin diving equipment because I wanted to go back to the grotto to snorkel, he offered his own gear to me. I have to say I felt honored because I knew how special his equipment was to him. When I was snorkeling around the grotto and then later out under the cliffs, I thought about my new friend and how he must feel in the winter months when he goes out in these same waters. When I think about most of my special memories the common thread of “feeling alive” is a result of being in the outdoors. This feeling can be from a simple walk in the woods. There is a lake near our house where I can swim to the shore from the center of the lake in about two minutes. I cannot imagine having an adventure in that lake but a simple paddle around the lake still makes me feel alive because my senses still appreciate the elements. I can get to the lake, launch, paddle around the lake and be back home in about an hour. That hour can make a terrible day fantastic. My daily workout at the gym (a mile swim) is great exercise but it doesn’t quite match a “feeling alive” activity. I was just thinking back to the winter of 1990 when I was out everyday training in the surf for the World Surf Kayaking Championships. If it was a workday I started surfing when it was early morning light. Winter morning surfing off of the southern California coast is not icy but it is cold. When I got to work I took a warm shower and was ready for the day. I have to say I was quite invigorated those days because of my early morning sessions in the outdoors. I know that a sense of adventure adds to the feeling alive concept. However, I can be out on a rather simple paddle and still feel alive because my body feels the outdoors around me. Getting out to feel alive does not have to be an expedition. For some it is their morning jog. Others feel it when taking the dog out for a walk around the neighborhood. I have a friend who uses their lunch break to walk out to the ocean. I am sure most of you can find a simple activity that can get you outside without much hassle or preparation that will give you a chance to “feel alive.” I encourage you to find that activity and do it to add to your day. The time spent is well worth it. After all, our trip to Italy was incredible with new experiences everyday. Yet the ones that come to the forefront for me are the simple paddle and snorkeling in the grotto in Sorrento.